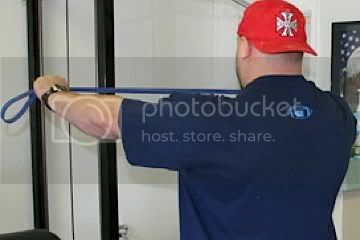 There are times that you are in the gym and you see someone using a new tool and wondered: What is that for? Now if we sat and talked about everything you seeing going on in a weight room we could be here for a couple of hours. Today we will tackle bands and their common uses. What's the deal with this huge rubber band? The three most common uses for me are stretching, band exercises and the occasional accommodating resistance. For stretching you can attach a band to that or anchor it to your appendage and pull for a greater range of motion. My favorites are the hamstring and pectoral stretch. For the hamstring you would lay on the ground and normally pull on the back of the leg but now you can attach the band to the bottom of your foot and pull on the band. For the pectoral stretch you attach it to a rack or anything overhead walk out where the arm is a 45 degree angle and keep your arm straight as you move forward to stretch the pec. You dictate the intensity by how far you move, so more range of motion the better. 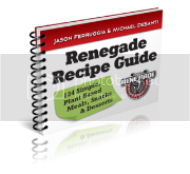 Band related exercises are very common in my programs because they are so freaking easy to add to your session it's stupid. Upper body day add a couple of sets of Band Pull-Aparts. When I trained a volleyball player this summer she was doing about 100-200 pull aparts and face pulls between exercises. I believe doing these helped her get her first unassisted body weight pull-up. 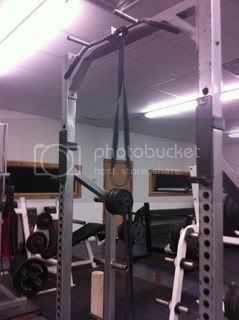 Can't do pull-up attach it to the top of the rack put your knee through the loop for some assistance. Accommodating resistance is an advanced method of using bands and chains to add resistance to an entire range of motion. For a quick example lets look at the squat. Photo Courtesy of West Side Barbell. You attach the band to the barbell ends in addition to the Olympic plates. 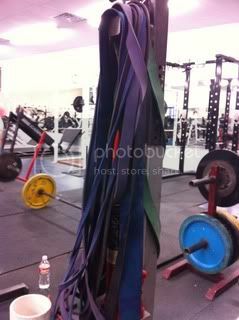 Since these are heavy duty bands they will add tension to the training weight making the weight heavier at the top because it's attached to the bottom of the rack. The typical setup is to have the most weight and tension at the top because it's when you are strongest completing the lift. A reverse band setup is the opposite and will assist you in locking out more weight. Bands are a versatile tool to have with you at all time and they are very durable. Now let's make sure we rub our brain cells together to ensure we don't do anything dumb that could cause an injury. Don't jump right into to using bands on the bar because you will get extremely sore. For more information look to Elitefts Band Exercise Index, Dave Tate's Accommodating Resistance and Louie Simmons Bands and Chains. Next up Part:2 Boards. If you aren't listening to some music when training you could be missing out on some PR's. Listening to music during exercise can make a strenuous task a little more bearable. If nothing else it gives you an excuse to listen to something you usually pass up when the wife or kids are in the car. Looking at my iPhone's "Top 25 Most Played" I came up with a list of tracks that helped me through my first cycle of the Jugg Method. Thursday has always been one of my favorite bands. I constantly find myself playing Thursday during training because their music has great instrumentals with well thought out lyrics. Let's not forget they put on a sick show. Musicians usually have meaning behind their songs, but the cool things about music is you can sometimes relate it to your life. "War All The Time" is Thursday's description of their tough childhood and finding comfort from those going through the same trials and hardships. Tough teenage years? Who can't relate to that? Hearing this songs reminds me of those difficult times most of us go through in life. Playing this songs also reminds me of a local marine who lost his life serving his country in Afghanistan. Now, without getting too political war affects many people especially those left to deal with losing a loved one. Young men and women join the military to serve their country and rely on each other to get through adversity. I appreciate your service to our country. I did not know the kid well, but we did train at the same gym. He stuck to the basics, lifted heavy and trained hard. Nothing but respect. RIP John Farias. As soon as i heard this song from Bone Thugs-N-Harmony I knew I wanted to cut a video to it. The attitude that the group and the song portrays is something I like. You can't listen to that song without thinking "Who gives a flip what you think. It's me and that's it." There are too many people walking around not everyone is going to agree with you or like you so stop wasting your time. Sometimes you just do what you do the way you've always done it. Slayer, not much to say hear. Best. Metal. Band. Ever. Slayer is a constant on my playlist because of the upbeat tempo which keeps me going during hard training. They open up Reign In Blood with this masterpiece. They aren't for everyone I get that. This song in particular is very controversial but you can interpret the meaning for yourself. The lyrics make you think and I use it as a constant reminder that everyone goes through things and sometimes people have had it harder than you. Don't complain. 3 of my favorite songs from a couple of groups that I frequent while at the gym. If you are able to self-motivate without the need for loud music, keep it up do what works.